Jordan Brand will be releasing their latest addition to the Winterized 6 Rings Collection as part of their Holiday Collection this year. 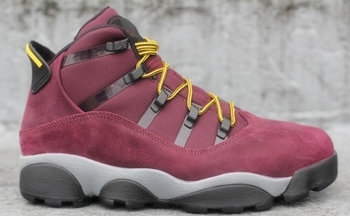 The Jordan Winterized 6 Rings, which was a combination of several famous Jordan Brand silhouettes, will be released in Deep Burgundy/Lion-Cool Grey colourway, which features a deep burgundy suede upper with grey midsole and black outsole plus yellow laces. This one will be coming out anytime soon so keep an eye on it!